Add a bonfire on the beach to your Easter Weekend plans. The bonfire is a day after the Full Moon to avoid conflict with Good Friday. We will start the bonfire near sunset and will need to be out by 10:00. The bonfire will be between Boardwalk 1 and 2. People ask if bonfire will be held if it’s cold or rainy….if the weather is so cold (i.e. below 40) or rain is threatening, the bonfire will be cancelled as no one would be comfortable attending. To keep things simple, each person brings what you want: food, drinks, chairs and a stick of firewood for a big bonfire. Nothing will be provided but a beautiful beach, a bonfire and, hopefully, a full moon. There’s always plenty of room on the beach for everyone, so invite a friend or bring your house guests. Full Pink Moon – April This name came from the herb moss pink, or wild ground phlox, which is one of the earliest widespread flowers of the spring. 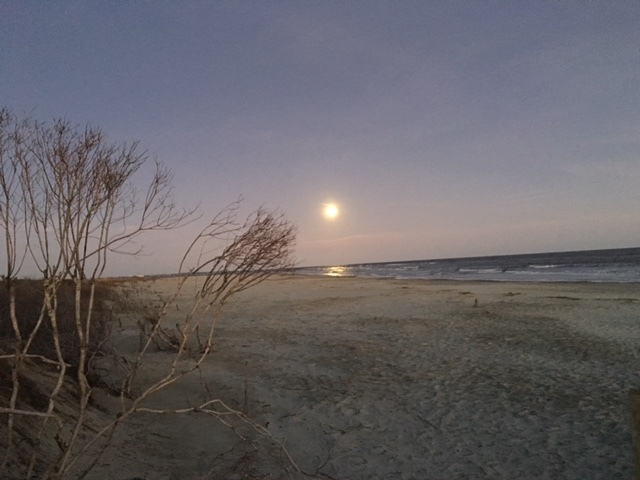 Other names for this month’s celestial body include the Full Sprouting Grass Moon, the Egg Moon, and among coastal tribes the Full Fish Moon, because this was the time that the shad swam upstream to spawn. I found another web site (http://newsclipper.hubpages.com/hub/The-Moon-Facts-Trivia-and-Folklore) This site also says the Cherokee Indians called it the Flower Moon and the English Medieval name was Seed Moon. Another web site (https://www.space.com/16830-full-moon-calendar.html) says the Chinese call it Peony Moon.